Some women cut their hair to enjoy the summer, without complicating themselves by high temperatures and enjoying the ease of a short hair, and they probably thought about lamenting it when fall comes, missing their long loops. But taking that decision couldn’t be more right, this year’s fall you can enjoy the growth of your hair, because the fashion dictates short hair to the shoulders, the Bob cut and other practical and casual styles are going to be the trend, here’s some photos of short hair for fall 2014. 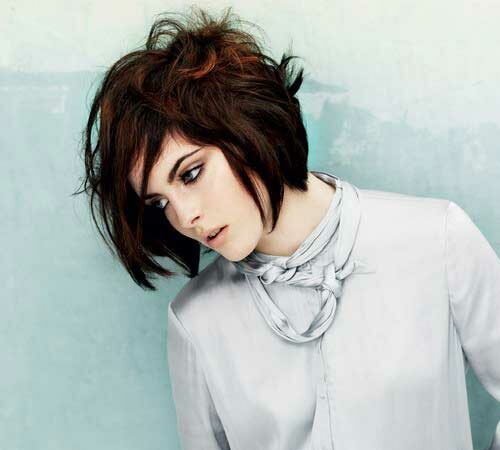 Check out these short hair trends for the fall of 2014 and take advantage of them. If you have straight hair because you get to wear your short hair and if it is wavy then you will also be fashionable. The bangs to the back, you should choose if you like it. Filled with beautiful loops, these will be perfect for large social events that arrive with autumn. Although some hairstyles will look like they’re not short hair, actually they are. That’s because it is considered long when it almost reaches the waist and beyond. So if you like to have shoulder-length hair, takes note of these styles and keep in mind that this long emphasizes the gaze, rejuvenates and is perfect for both a very young girl and an adult female. No doubt that with these haircuts for fall 2014, you will be at the trend of hair fashion for the whole season that is coming.